Guest Post: What… no Brahms?! I’ve just spent three days in Vienna, Austria and must confess I am severely disappointed in the Viennese people. It’s certainly not because of their lively and clean city filled with beautiful public buildings and pleasant squares, palaces and coffee shops and musical venues. No. It’s certainly not due to the denizens themselves who are polite and cultured to an extraordinary degree. 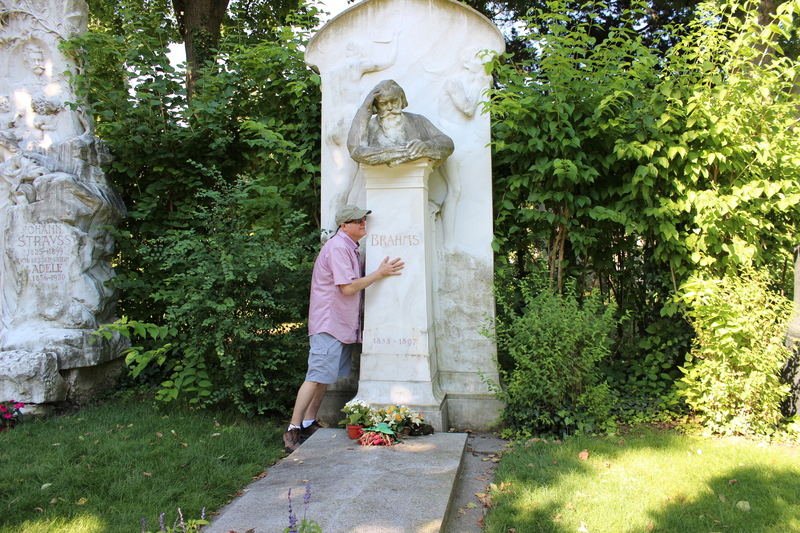 The reason for my well-placed ire is the Austrian capital’s almost complete lack of honoring one of their most famous and beloved (admittedly adopted) sons: Johannes Brahms. This is the City of Mozart. Now I’m the first to admit that Wolfgang is no musical slouch and only a mad, uncultured lout would think his music anything but a noise close to musical perfection, but jeeze!—after walking around the city a couple of days you’d think there was only one classical composer in all the world. Wolfie is everywhere… and I mean everywhere. His likeness graces candy boxes, liqueurs, (he’s got his own brands), refrigerator door magnets, posters, store-fronts… he’s got his own venue across the straße from the city’s grandiose opera house where his minions are dressed in the lacy, periwig-donned, white-hosed attire of 18th C. court musicians who stand on the street corners and squares throughout the city peddling programs for his nightly concerts. I’m frankly surprised that his mug was not displayed on a package of “Die Zauberflöte”-brand prophylactics in the local pharmacy! C’mon, Viennese… where’s your sense of fair play? Only by the most assiduous planning and painstaking preparations was I able to uncover two meager traces of my beloved Johannes in this, the City of Music. The evidence of him can be seen a little ways east of the city center in the humungous Zentralfriedhof, Wien’s main cemetery. It was to that sprawling boneyard that I had to travel to see evidence of his earthly remains. They are buried under a simple yet graceful monument in section 32A (plot #26) of the cemetery in an admittedly honored spot. He shares the distinction with fellow dead musical alums Beethoven, Strauss, and Schubert, although I’m forced to admit Wolfie, who heavens-to-betsy, cannot be forgotten, has insinuated himself in the area with a monument placed in the center of it all, even though the marker has no body laying beneath—it’s interred elsewhere. I’m very excited to be within 6 feet of his moldering body! 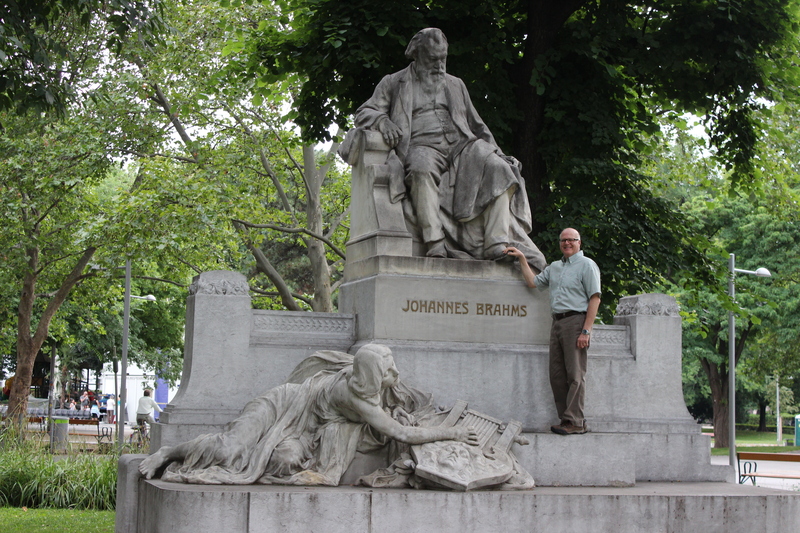 The only other place Brahms is to be publicly seen (if one is to discount the little corner given him in a room of the Haydn Museum on the Haydngasse, is his statue located within the leafy environs of the Resselpark, one of the main parks of the city. It sits beneath a pleasant canopy of trees and the stone effigy of Hans looks out solemnly onto the roaring traffic of the Karlsplatz. After gazing at it adoringly for several moments I thought the sculptor captured the rather gruff and earthy composer quite perfectly, although the overall attitude of his stocky body seems as if he is about to rise from his seat and change the channel on his TV set because his remote is broken. So, my simple message to the Viennese is: more Brahms! I’m so sorry there aren’t more Brahms thing to see. It must be very disappointing for you. My suggestion for you is to drink more beer. “More beer, more beer!” or was that brandy?